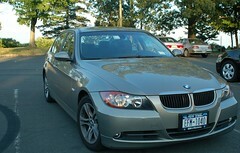 My good friend Patrick recently signed up for Zipcar, and this week he invited me along for his first test drive. I’ve considered joining myself, especially under pressure from Chris, who’s been a member for some time, and I knew that Zipcar offers BMWs, so we decided to take one for a spin to see how it performed. along the West Side Highway, over the GWB, and up the Palisades Parkway, stopping at an overlook before turning west and driving through Bear Mountain State Park. The lookout by the Hudson River had some pretty spectacular views. I’ve lived in New York for nearly four years now and I rarely leave the city limits, so this was fairly new to me. 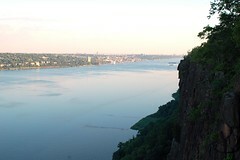 The Palisades are two-hundred to five-hundred foot cliffs that rise vertically from the western bank of the Hudson to a plateau at the top. 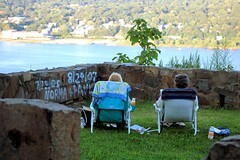 From the lookout, you can see south back toward Manhattan and the Bronx, and northward into Rockland County. After a trip through the park, we headed west to the Delaware River, near the intersection of New York, New Jersey, and Pennsylvania at Port Jervis. We tried to find something to eat but came up a bit short. We walked into Arlene ‘n’ Tom’s Restaurant, which purported to be the home of the Meanyburger. Unfortunately, they close at 9, and we walked in at two minutes past. The only open establishment we could find was a Port Jervis Pizza, where we grabbed a slice and hit the road again. 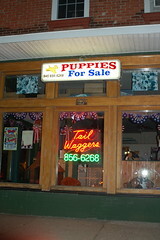 I did spot a shop which sold puppies, and judging by the age of the signage, has been selling puppies for some time. From Port Jervis, we headed south along the river, along River Road which is a good windy stretch of highway perfectly suitable for testing the handling of the BMW. We were impressed with the sport shifting and the performance of the car close to the redline. By this time it was pitch-dark outside, and we were driving through woodlands which probably were home to a fair number of animals which might wander into the road. Neither of us felt like explaing to zipcar why a deer ended up through the windscreen, so we kept the speed to a reasonable level for most of the drive through the woods. We ended up on Route 15, heading south, and ended up skirting around the edge of Jefferson, Alex’s hometown, finally getting on I-80 back into the city. I’m generally impressed with the zipcar rental concept, and the cars they have available. I’m not yet convinced that I need to sign up myself–I can think of few occasions where I particularly need a car–but you never know. What a jolly afternoon – you and Pat out for a drive in the country. I especially like the name of the pet store although some dogs would feel glum at the choice. Boxers, bulldogs etc. I don’t think the couple in the photo are Norma and Paul. A bit too staid o be graffiti users, but they could be the parents of one of them. You are currently reading Zipping at gdickinson.co.uk.